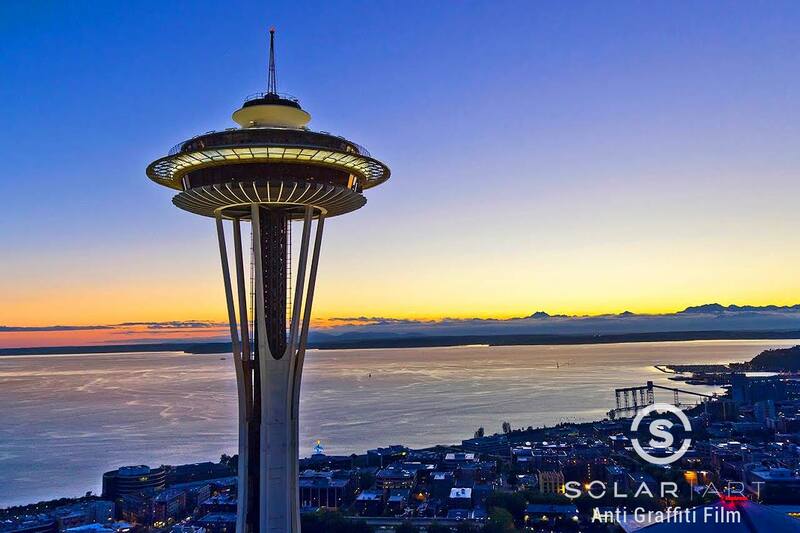 Solar Art was lucky enough to install anti graffiti film to the Space Needle in Seattle, Washington! The customer was having a problem with the glass in the observatory and the glass benches in the observatory at the top of the Space Needle getting keyed, etched and vandalized repeatedly. They were tired of spending a fortune constantly replacing the damaged glass. They reached out to Solar Art to see what their graffiti film options were. They worked with our sales representatives and ended up having anti graffiti window film installed in several locations at the observatory. Graffiti film is a cost effective and very simple way to protect your glass against vandalism, graffiti and more. The window film is installed right on top of the glass and and will take the wrath of the vandalism, not the glass. Anti graffiti film can be applied to both the interior or the exterior of the glass, depending on the purpose. If the anti graffiti film does get tagged, it is easily removed and replaced with fresh layer, for a fraction of the cost of what it would be to replace the glass itself. Graffiti film can be installed on surfaces other than glass, such as metal and aluminum surfaces. This works great for areas like vending machines, elevators and escalators. The Space Needle can decide later on to get the elevators that lead up to the observatory filmed with graffiti film to add protection against vandalism. Typically, the most high trafficked areas in a space is what gets vandalized. With the Space Needle, the observatory gets extremely high traffic with the tourists and visitors, the glass was very susceptible to being damaged. Just like solar film, decorative window film and security window film, anti graffiti film blocks 99% of UVA and UVB rays. It is an optically clear film so customers and potential vandals won’t even know it’s there. Solar Art has also installed graffiti film to residential settings as well. Contact Solar Art to see if anti graffiti film is right for you! Contact us directly to talk about anti graffiti film! Graffiti film is an affordable and easy way to protect your glass against vandalism. In the case of graffiti or etching, anti graffiti film is easily removed and replaced. Contact Solar Art to learn more!